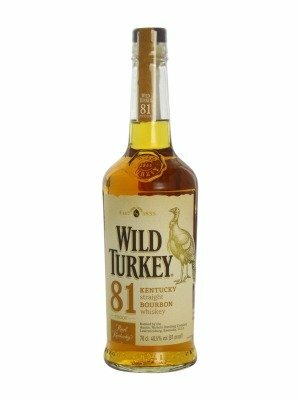 Wild Turkey 81 Proof 8 Year Old Kentucky Straight Bourbon Whiskey is a popular Whisky available from Tesco Groceries in 70cl to buy online. Visit Tesco Groceries for the best price for 70cl of Wild Turkey 81 Proof 8 Year Old Kentucky Straight Bourbon Whiskey or compare prices on our other Whisky products. Wild Turkey 81 is a mix of aged Bourbons (between six and eight year old) from the hert of Kentucky. The classic taste of Wild Turkey is produced using rye mash which delivers a warming kick to the finish of the whiskey. Wild Turkey is aged in new oak barrels giving it a taste that is unique the world over and older than other whiskey's in this bracket. Where to buy Wild Turkey 81 Proof 8 Year Old Kentucky Straight Bourbon Whiskey ? Wild Turkey 81 Proof 8 Year Old Kentucky Straight Bourbon Whiskey Supermarkets & Stockists. You can buy Wild Turkey 81 Proof 8 Year Old Kentucky Straight Bourbon Whiskey online in most retailers and find it in the Whisky aisle in supermarkets but we found the best deals online for Wild Turkey 81 Proof 8 Year Old Kentucky Straight Bourbon Whiskey in Tesco Groceries, DrinkSupermarket.com, TheDrinkShop, and others. Compare the current price of Wild Turkey 81 Proof 8 Year Old Kentucky Straight Bourbon Whiskey in 70cl size in the table of offers below. Simply click on the button to order Wild Turkey 81 Proof 8 Year Old Kentucky Straight Bourbon Whiskey online now.